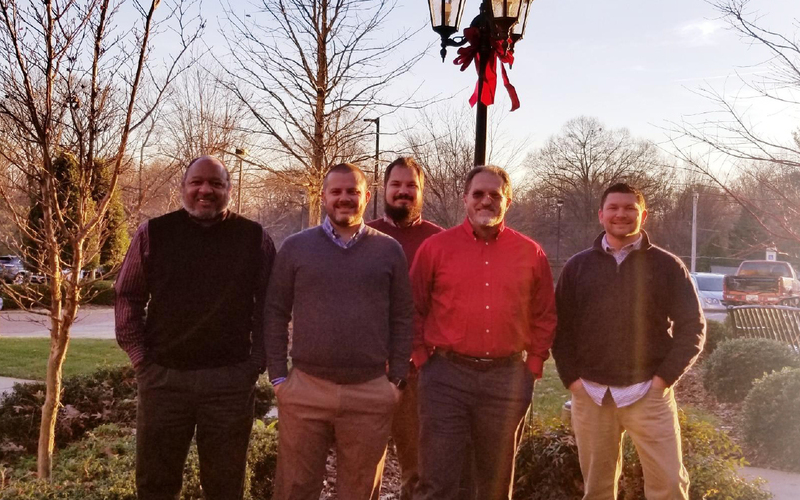 Members of the Iredell Health System HTM Department include (from left to right) Director Sterling Brown, Charles “Chuck” Braswell, Codi Nelson, Barry Heffner and John “Brad” Bennett. Statesville, North Carolina is a city in Iredell County. It was established around the time that the Constitution was being ratified. Iredell Memorial Hospital is the largest and only nonprofit hospital in Iredell County and is located in Statesville. It is a 247-bed hospital and employs approximately 1,600 people. The hospital has been in operation since 1954. With additional facilities, the hospital is part of the Iredell Health System. In addition to the hospital the health system includes the Iredell Physician Network, which is comprised of 18 clinics, offices and family care centers throughout Iredell, Alexander and Davie counties. 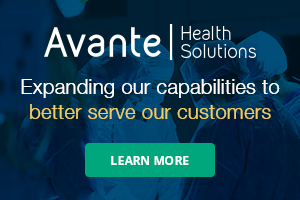 The health system’s Healthcare Technology Management Department is a contracted service provided by Crothall Healthcare HTS, a Division of Compass One Healthcare. The HTM team consists of Director Sterling Brown, CBET; Codi Nelson, CBET (BMET III and team lead); Barry Heffner, CBET (BMET III); Charles “Chuck” Braswell, CBET (BMET II); and John “Brad” Bennett (ISE II). Bennett is currently studying for the CRES exam. Brown and Nelson are currently studying for the CHTM exam. Heffner is pursuing a degree in networking at the local community college and Braswell is the Crothall Southwest Regional CEIT designee. The HTM department is responsible for asset management of almost 5,000 devices. According to Brown, the team prides itself on being able to maintain nearly all of the medical devices in-house. The only service contracts in place at Iredell are for high-end imaging (CT, MRI, linear accelerator). The hospital manages those contracts, but the HTM department oversees the service and maintains the maintenance documentation. Data collection is accomplished through a dedicated system. 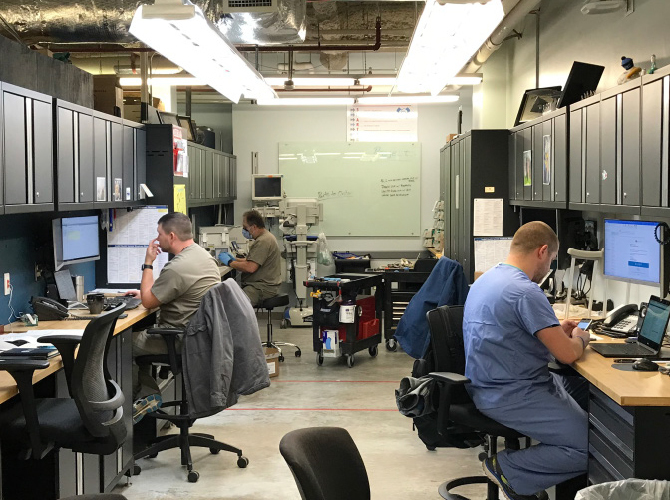 “Crothall Healthcare utilizes Maintenance Connection (called Team Trace within Crothall HTS) as its CMMS. All technicians are issued laptop computers and most documentation is done in real time while out on the floor,” Brown says. Techs work on equipment in the shop at Iredell Health System. The team plays an integral role in the capital acquisition process and has been active in a shop renovation. “The HTM department, although a contracted service, has proven itself to be an integral and vital component of the mission at Iredell Health System. Every medical device purchased at Iredell must first be approved for use by the HTM department. The department plays an active role on the capital equipment planning committee. We facilitate the quotes and ensure that the devices will meet the requirements/needs of the clinical and medical staff at the hospital,” Brown says. Brown notes that they are in the process of upgrading the patient monitoring system at the hospital. “We are working very closely with the vendor to ensure that the project stays on track and that the scope of the project is adhered to. The scope includes replacing the backbone of the system – network hardware, switches, computers, servers, racks, cabling, etcetera – as well as upgrading the software that runs the system,” he says. Brown adds that this includes new patient monitors, telemetry transmitters and the associated components. “Another project, that is closer to our hearts, is the renovation of the biomed shop. When Crothall assumed the responsibility for the HTM program at Iredell in October 2016, the physical appearance of the shop was typical of what we have come to expect in most shops (usually located in the basement, next to the boiler room or morgue),” Brown says. The furniture and workbenches were cast offs and hand-me-downs that the techs had scrounged from the discard pile on the loading dock. “Our shop is actually inside the hospital engineering shop. We have a small slice of the main plant operations shop. In the last two years, we have totally renovated the technician workbenches, storage cabinets, tool cabinets and my desk. This has proven to be a huge morale booster, the shop looks very professional, and the techs take personal pride in maintaining it that way,” Brown says. 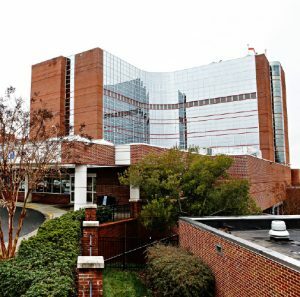 He says that last year, during Healthcare Technology Management Week, they held an open house for the clinical and medical staff at Iredell that was a tremendous success. “The majority of the staff had no idea where we were located and what the shop looked like. We received numerous comments on the appearance of the shop as well as the stations we had set up – incoming inspections, electrical safety testing demonstration, infusion pump performance verification and defibrillator performance verification; to name a few,” Brown says. Brown says that Crothall Healthcare is also a sponsor of the Iredell Memorial Community Golf Classic, which benefits the Iredell Memorial Hospital Institute for Nursing Excellence and Innovation. This organization assists nurses with educational endeavors, specialty certifications and nursing leadership development. The HTM team has also contributed to help all of the health system’s employees with access to useful information. “When Iredell Health initiated its ‘Moving Forward Together’ initiative to boost staff morale and improve employee satisfaction, the biomed technicians were integral in the process. We volunteered to be part of the focus groups (employee communication, employee appreciation/recognition and employee feedback),” Brown says. He says that the Communication Group developed a new employee interface called I Connect. It is a web-based portal for accessing all of the hospital’s intranet sites from any computer or smartphone/device. “The Employee Recognition Group developed a reward system based on points that can be awarded for going above and beyond. These points can be redeemed for merchandise from the Company Store. The feedback group recommended open employee forums that allow employees and hospital admin the opportunity to have open and honest dialogue concerning issues at the hospital,” Brown adds. When not helping out colleagues or performing maintenance or repairs, the team members are involved in the state biomed community. “All the techs are members of the North Carolina Biomedical Association (NCBA). Codi and I are members of the Association for the Advancement of Medical Instrumentation (AMMI). Codi Nelson is a past president and board member of the NCBA and is currently serving as media coordinator. He is also on the AAMI Awards Board,” Brown says. A small, dedicated HTM team keeps every medical device running well in Iredell County, North Carolina.